The Rebel Sweetheart. 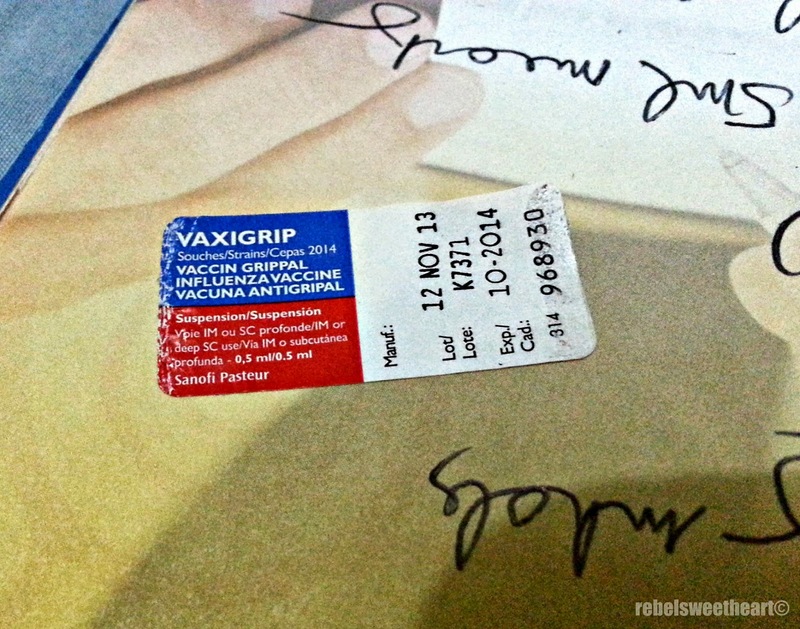 : Flu Shots | Better Safe than Sorry! 'Twas like a family outing as my brother, sis-in-law, my niece, and my little man and I trooped to the pedia this afternoon. But don't worry, it's not because the kids are sick or anything. We just paid a visit so the kids can get their flu shots. It's almost the rainy season, after all. And as we all know, the flu becomes prevalent during this time of the year. 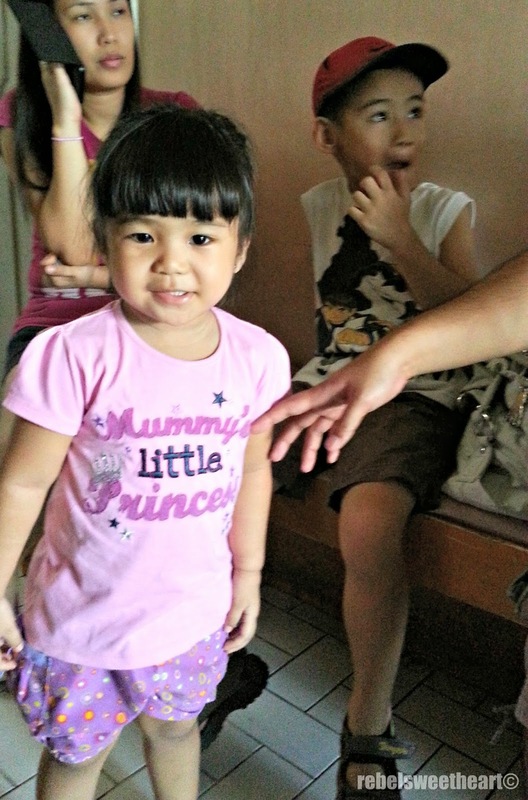 Little Miss Maggie (and Yue) waiting for their turn at the pedia. Influenza, more commonly called as the flu, is a viral infection that affects the respiratory system - the nose, throat, and lungs. It is a serious disease that can lead to many complications, and the best defense against it is to receive an annual vaccination. - Kids 6 months through 4 years old. - Adults 50 years old and above. - All women who are pregnant, are considering pregnancy, have recently given birth, or are breastfeeding during flu season. - Residents of long-term care facilities, such as nursing homes. The best time to get the vaccine for influenza is before the start of the flu season. Since it takes about two weeks after vaccination for antibodies (that protect against influenza virus infection) to develop in the body, it is recommended that people get vaccinated before influenza begins spreading in their community. In the Philippines, the flu season coincides with the rainy season. It is best to get the vaccine during the summer months, between March and May. You may still get the vaccine outside these months, because getting a shot later in the season is still better than not getting the vaccine at all. The immunity lasts until the year's flu season (because of the change in the prevalent strains of the virus every year). Hence, the vaccine must be given every year. Mommies, have your kids received their flu shots this year? Do you get flu shots, too? I hate to say this but the only time I ever got the flu-and a really bad case of it-was when I got a shot. So now I take my chances-it seems I may have a natural immunity to that monstrous bug! I was always against the flu shot but with my asthma now, it is a must. A cold or flu and can put me in the hospital and leave me in bed for a month or more trying to breathe. Glad to say the kids got their flu shots already! :) You're such a great mom for always making sure your son is prepared for anything! I am still on the fence whether I will get another flu shot. I still got sick this season don't know how much it's supposed to protect you. My husband is a physician in the US. He had a patient (who is also a family friend) two years ago who was not in any of the high risk categories. She got the flu and all its complications. She was hospitalized for several weeks -- the first few days were touch and go. Two years later, she has not completely returned to her pre-flu days, fatiguing easily. She is probably the world's greatest advocate for the flu shot! I believe all children should get the flu shot so the flu is not spread. Thanks for sharing. We are just ending flu season here. Absolutely true , better safe than sorry and your flu shot day turn into an enjoyable family day. I do not believe in giving my kdis the annual flu shot. We used to, but then I read a lot of research saying that their bodies don't need it. We've been off it for the past three years, and they just keep healthy by eating the right kinds of food.